La Aroma de Cuba cigars have be re-released under the supervision of famed cigar producer José “Pepín” García. These hand-rolled premium cigars are now manufactured in Estelí, Nicaragua at My Father Cigars under the Ashton Cigar Company line. La Aroma de Cuba cigars feature a perfectly aged Connecticut Broadleaf wrapper and infused with a new spicier blend of the finest Nicaraguan tobaccos. Fans of Nicaraguan cigars will love the bold flavors these premium cigars offer. Each provides a consistent medium-bodied profile that is well-balanced with rich hints of brown sugar and cool spice followed with earthly and cedar notes, finishing with a smooth and elegant finale. Stock up your humidors with these masterpiece handmade cigars from Nicaragua. 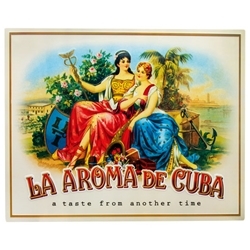 Smokers Discounts believes you'll love La Aroma de Cuba premium cigars, we’ve made it easy and affordable to purchase them at our online cigar store. A variety of sizes and flavors are listed below, each of these styles are in stock and available today for a low discount price. Call us for more details!